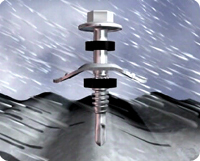 Buildex® range of Galvanised bonded washers with EDPM washers (Ethylene Propylene Diene Monomer) are used in the assembly of Roofing and cladding screws where there are no cyclonic winds or heavy rains. EPDM gives excellent physical and chemical properties, particularly in high ozone environments. An EDPM washers bonded to a galvanised steel washer. For protection in high wind situation, Buildex® has a range of Cyclone plates approved by James Cook University the leading Australian testing Authority. All plates are approved and suitable for use in the most severe Category 5 Cyclone (Hurricane, Typhoon) regions and have been designed to suit corrugated and square rib profiles. Steel support washers with E.P.D.M. at the top of profile.